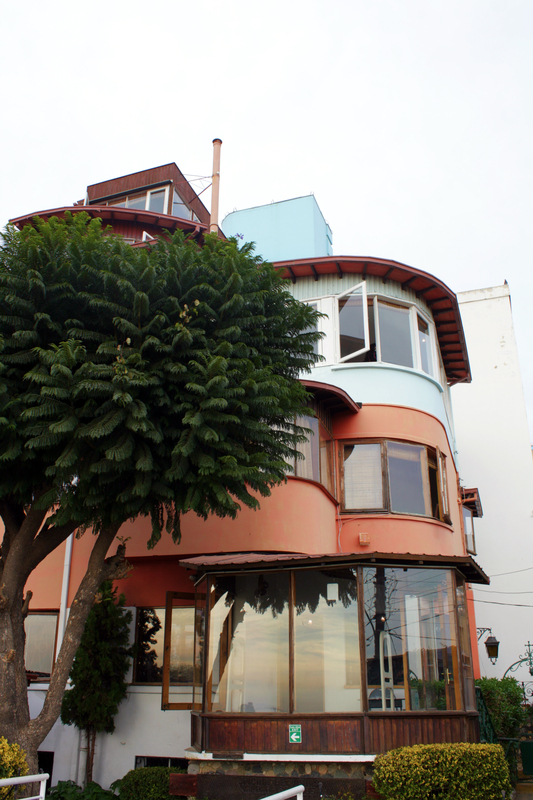 La Sebastiana- Neruda's Valpo vacation home. One of the things that struck me most about Chile is their love for dogs. If they hadn’t already adopted a canine family member, then they are out on the streets showering their affections on the roadside strays. Bowls of doggie treats and water are left out on street corners and in front of shops; parks host kennel colonies where stray dogs can retire in comfort, and footpaths sport the mottled remains of canine faeces. Nowhere is this more apparent than in the port-city of Valparaíso, located two hours from the Chilean capital of Santiago. Known for its vibrant facades, this city of noticeably steep hills oozes a laidback charm, and apparently, dog ordure. 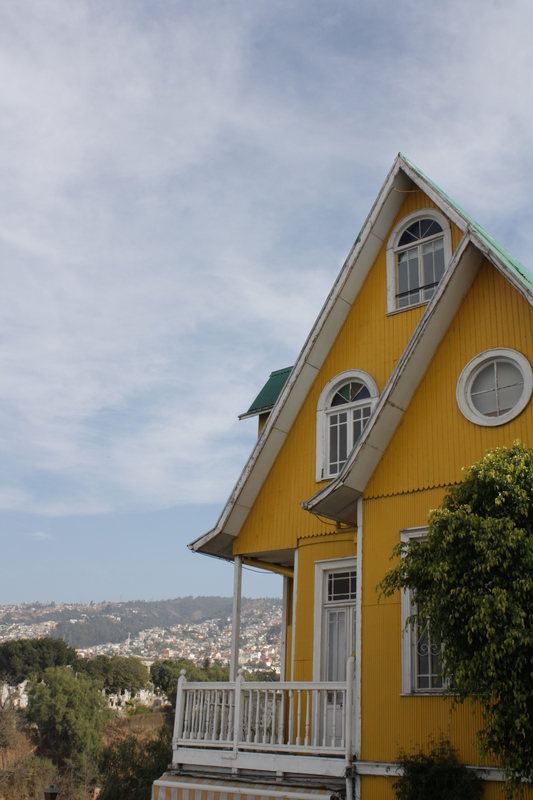 A UNESCO World Heritage Site, Valparaíso’s bohemian vibes have long drawn the likes of poets and artists. 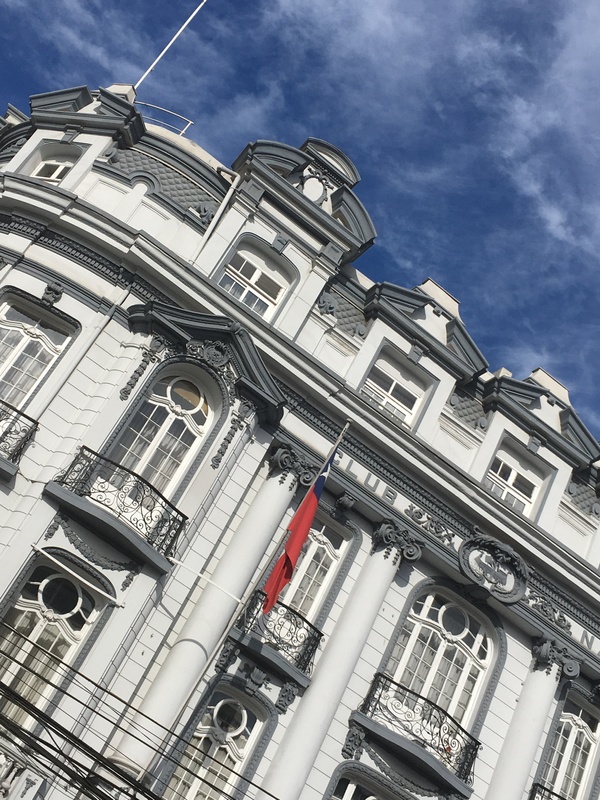 Nobel Laureate and possibly Valpo’s most famous resident, Pablo Neruda even penned an ode to the city, “Oda a Valparaíso.” Venturing out on the first day from our AirBnB, I just couldn’t see what the fuss was about. The city is divided into “El Plan” or the flat, plains by the port and the “Cerros,” or the hills, of which there are 42. Our apartment in El Plan, was sandwiched between the indigo waters of the port and the jumble of colourful buildings on the steep hills. While it certainly made for a vivid picture, it also felt quite chaotic. Many of the buildings, though pretty, were grime-laced and ramshackle, hemmed in by gritty footpaths. I found myself expertly navigating the littered streets, stepping around the assortment of garbage, and of course, the inescapable dog poop – a lifetime of training walking on the streets of Dhaka kicked in. Why were we even here? Even in his poetic tribute to the city, Neruda affectionately calls it “dishevelled.” Surely that should’ve given us a clue? Nevertheless, we soldiered on, retiring my son’s trusty stroller and breaking out the baby carrier, in the hopes of tackling some of the hills. Both my son and my back screamed in protest as I wheezed and sweated up several flights of stairs. I’d pause every so often in the pretext of pointing to my son the cargo ships anchored in port, but in actuality, because I needed a chance to catch my breath and mop my brow. 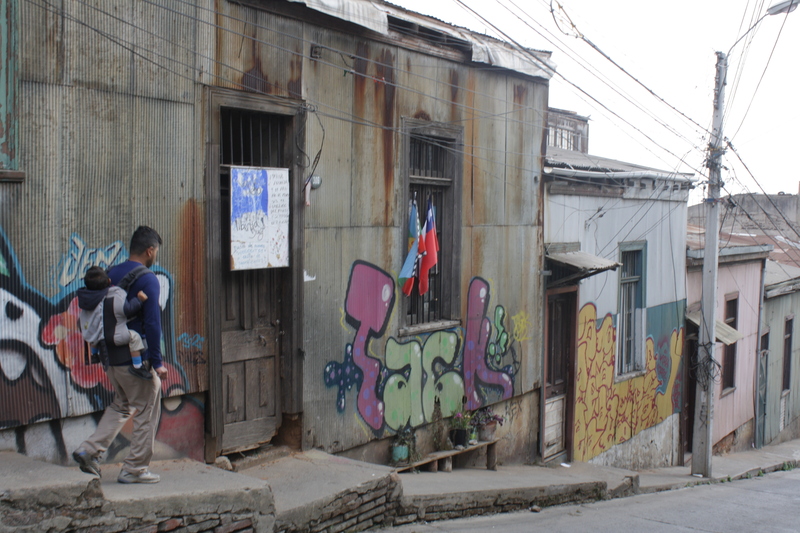 We trekked further up narrow, winding passages lined by graffiti covered buildings, some of which were pretty. We made a pit stop at a playground to let my toddler burn off some energy (and for me to rest). It was beyond run-down – the slide was broken and the see-saw was missing seats. The dogs there, however, were having a nice snooze under the sole bench, also broken. We finally reached La Sebastiana, Neruda’s nautical themed home on Cerro Bellavista, where we were greeted by two rotund cats. Happy for a break from canine company, my son and I rushed to them for some feline cuddles. The poet’s house offered breathtaking views of the harbour and some quirky architecture, but not much more. So we thought we’d be on our way after using the facilities, where I unfortunately found one of my new feline chums drinking deeply out of the toilet. 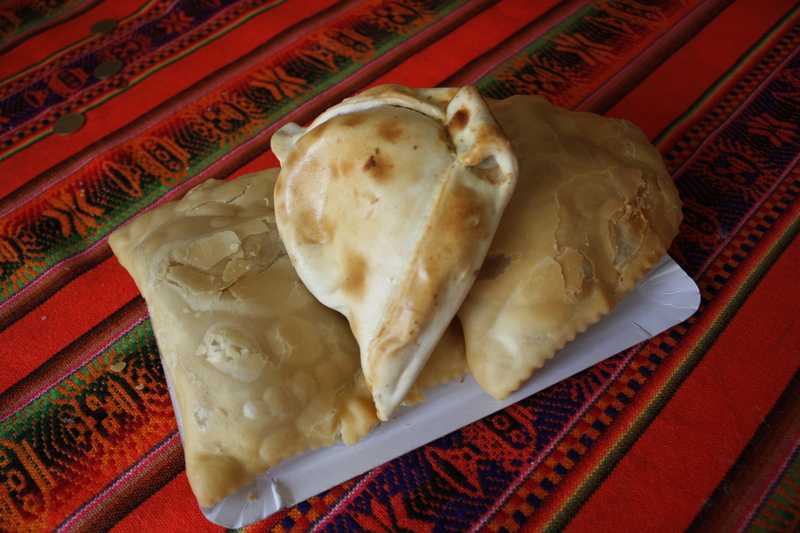 Later that afternoon we stumbled upon a couple of things that made us warm up to Valparaíso a bit more – giant, deep-fried empanadas the size of my face, stuffed with seafood, or cheese and octopus, and the trolleybus. 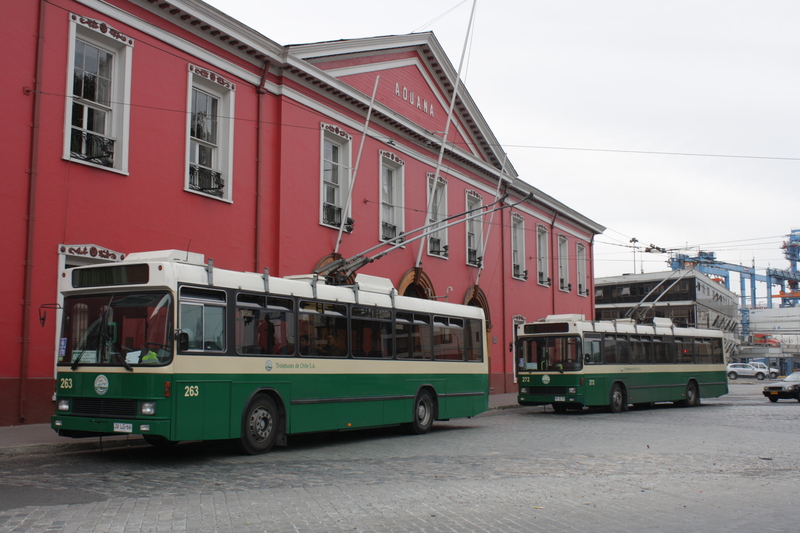 They trolleybus looks (and is) like the lovechild of a tram and a 1950’s bus. In operation since the 50s, the trolleybuses are not only a cultural heritage of Valparaíso, but still serve as one of the primary modes of transport around the centre. Much to my son’s delight, we hopped aboard one and went for a ride around the city centre. The driver, a lovely man who wiggled his eyebrows at my son while taking tight curves, gave us tips on where to get great seafood and the best views of the city. 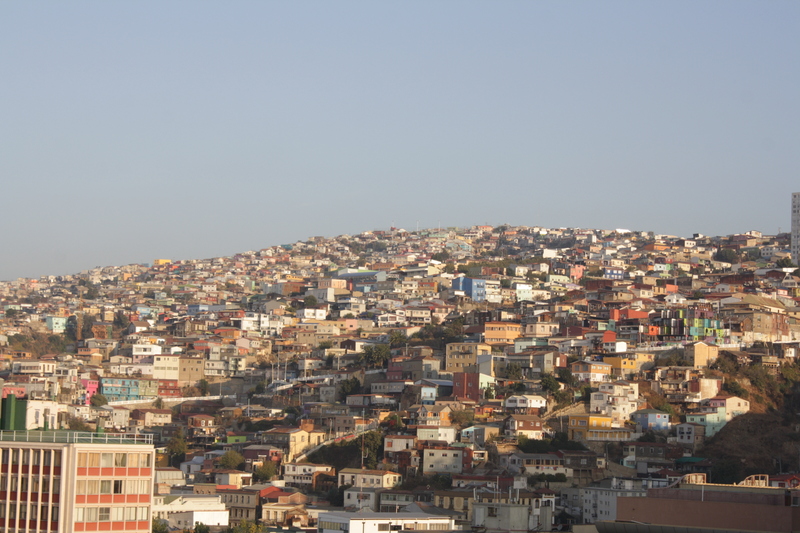 It wasn’t until I went up to our apartment rooftop at sunset, that I fully realised Valparaíso’s potential. As the setting sun cast an orange glow over the hilltops, the multi-coloured houses lit up, as if by technicolour magic. 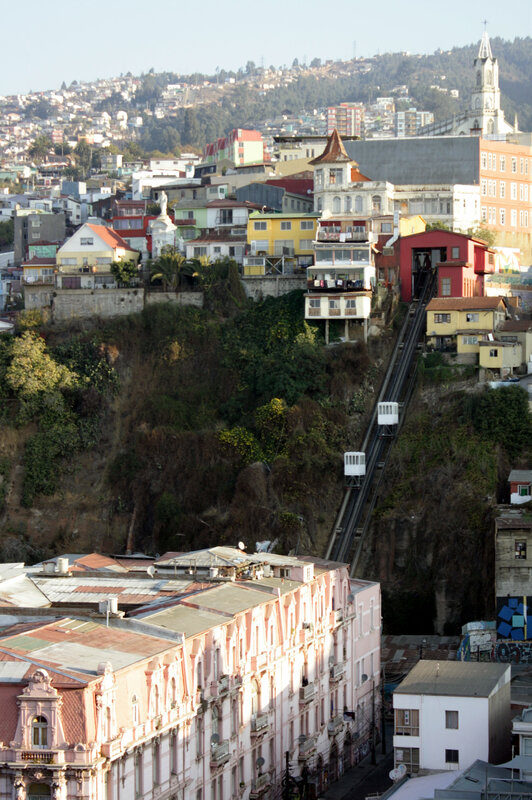 19th century funiculars, still in operation, rattled up and down the hills, ferrying passengers up ridiculously steep terrain. Below, the plains stretched out to the harbour, the shimmering water dotted with an array of ocean going vessels, all painted ginger by the setting sun. An Instagrammer’s dream, the scene made me itch to paint, but alas I had none. The next day my husband and I decided to split up and take it in turns to explore the hills. Neither of us wanted to shoulder a 12 kilo bundle of toddler tantrums and hike the labyrinthine passages. An excellent decision, as we were each able to see, first-hand, what all the fuss was about. The cobble-stoned streets wended their way through vividly coloured houses and storefronts. 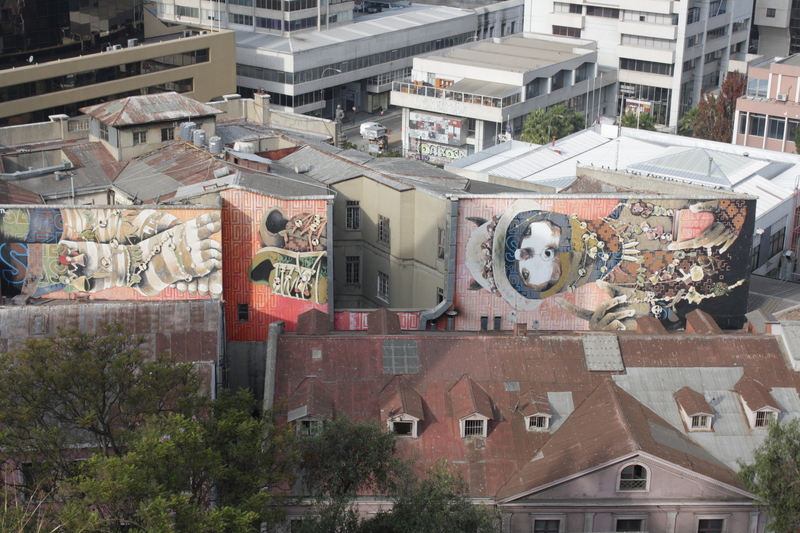 On Templeman Street in Cerro Alegre, street artists had run amok, adopting the building’s facades as their canvas. The buskers on Cerro Concepcion serenaded passers-by as they strolled down the narrow streets, surreptitiously licking ice creams. Local artisans plied their trade from street stalls set alongside quaint cafes selling macarons and other delightful desserts. Students sat around on wide steps, chatting over cold pints. Artists and sculptors showcased their work in street corners, turning the alleyways into an open-air art gallery. All this against the backdrop of the brilliant blue Pacific! As Neruda aptly put it, “Valparaíso, what an absurdity you are, how crazy: a crazy port.” I finally understand the lure of Valparaíso. Next stop: Viña del Mar!